It’s Christmas Eve and a mysterious gift sparks a wondrous adventure! Journey to a Land of Enchantment filled with swirling snowflakes, dancing dolls, soldiers, mice and more set to Tchaikovsky’s glorious score with three scenes and 40+ dancers of all ages! 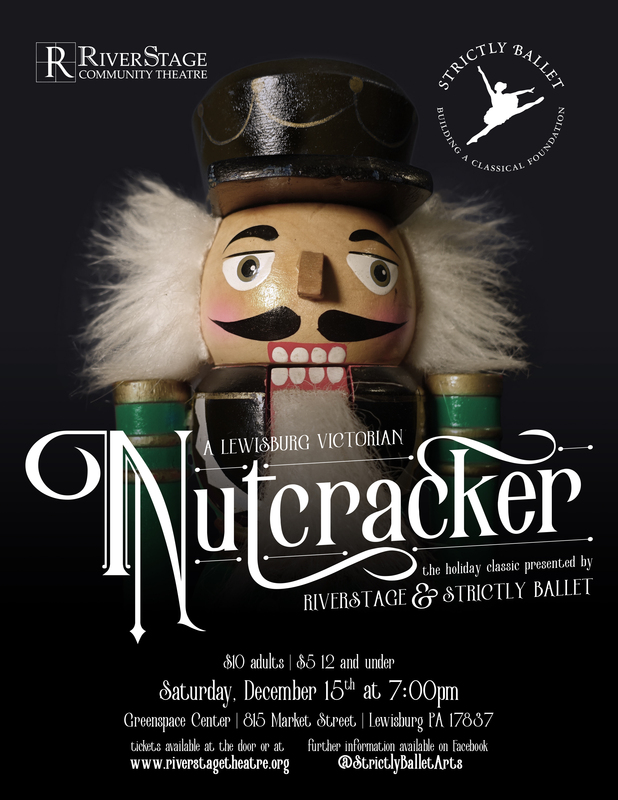 RiverStage Community Theatre and Strictly Ballet are pleased to join forces for a one-night only performance of A Lewisburg Victorian Nutcracker, just in time for the holidays. This one-act presentation of Tchaikovsky’s classic ballet will be held on Saturday, December 15 at 7:00 pm at Greenspace Center, 815 Market Street in Lewisburg. All seating is general admission and tickets are just $10 for adults or $5 for children age 12 and under and can be purchased in advance by clicking here! Doors will open between 6:15 and 6:30pm for the 7:00pm performance. A Lewisburg Victorian Nutcracker, with musical score by Pyotr Tchaikovsky, tells the story of the young girl Clara Stahlbaum who receives a wooden nutcracker doll on Christmas Eve from her mysterious godfather. That night, after everyone else has gone to bed, Clara’s doll is transformed into a handsome prince and she finds herself whisked away on a magical adventure filled with brave soldiers, fearsome mice, dancing snowflakes and more. The Nutcracker has become one of Tchaikovsky’s most famous compositions, and the story has enjoyed enormous popularity for over 50 years as it is performed by ballet companies all across North America during the Christmas season, and this production is inspired by the concept of ‘Community Nutcrackers,’ which have been performed in various towns and cities across the United States. This production of A Lewisburg Victorian Nutcracker will feature 46 performers including Sarabella Reynolds in the main role of Clara, Jake Rothman and Teddy Casimir as the Nutcracker Prince and Nutcracker, Brien Reynolds as the Mouse King, Jove Graham as the Godfather, and Kendyll Hazzard as the Snow Queen. Clara’s mother, father and brother Fritz will be played by Emma Kristjansson-Gural, Josiah Lawrence and Hugh Ikeda Shields, respectively. Also featured in this production is a large cast of dolls, children, snowflakes, parents and mice, including Lydia Delsite, Kara O’Rourke, Calaina Berry-Propst, Lauren Fisher, Anna Gasaway, Audrey McSween, Annika Ikeda Shields, Elliot Wilson, Ceili Kisvarday, Ellis Reed, Orissa Reed, Darya Shimony, Liya Shimony, Nora Chiboroski, Ellie Kisvarday, Zoli Kisvarday, Mitchell McSween, Clara Graham, Thomas Graham, Anastasia Kahler, Cylas Kelbatyrov, Cat Kisvarday, Laine Kolak, Olivia Sanduta, Callie Exner, Sadie Featherstone, Carolyn Gasaway, Jordyn Lauver, Rachel Erdman, Sarah Bell, Trey Casimir, Rick Erdman, Allie Focht, Mark Galbraith, Emma Germbeling, Chris Kisvarday and Nicole Shoop. Production design is by Peter Wiley and Trey Casimir, with lighting design by Stefan Eisenhower.